January 22nd in African American History - James Anderson, Jr.
January 22, 1947 James Anderson, Jr., the first African American United States Marine recipient of the Medal of Honor, was born in Los Angeles, California. 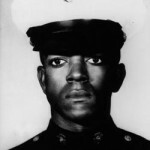 Anderson enlisted in the marines in 1966. He was promoted to private first class after graduating from recruit training and sent to Vietnam as a rifleman, 2nd Platoon, Company F, 2nd Battalion, 3rd Marine Division. On February 28, 1967, his actions earned him the medal, America’s highest military decoration. His citation partially reads, “Company F was advancing in dense jungle northwest of Cam Lo in an effort to extract a heavily besieged reconnaissance patrol. Private First Class Anderson’s platoon was the lead element and had advance only about 200 meters when they were brought under extremely intense enemy small arms and automatic weapons fire. The platoon reacted swiftly, getting on line as best they could in the thick terrain, and begun returning fire. Private First Class Anderson found himself tightly bunched together with the other members of the platoon only 20 meters from the enemy positions. As the fire fight continued several of the men were wounded by the deadly enemy assault. Suddenly, an enemy grenade landed in the midst of the Marines and rolled alongside Private First Class Anderson’s head. Unhesitatingly and with complete disregard for his own personal safety, he reached out, grasped the grenade, pulled it to his chest and curled around it as it went off. Although several Marines received shrapnel from the grenade, his body absorbed the major force of the explosion. In this singularly heroic act, Private First Class Anderson saved his comrades from serious injury and possible death.” Anderson was posthumously awarded the Medal of Honor on August 21, 1968. The United States Navy preposition ship, PFC. James Anderson, Jr., and the James Anderson, Jr. Memorial Park in Carson, California are named in his honor. ← January 21st in African American History – Eric Himpton Holder, Jr.